Apps for texting from your PC like MightyText and Pushbullet always come up when discussing ways to send SMS messages from your PC. But they tend to limit your monthly texts unless you pay for a costly Pro subscription. Pulse, one of the best alternative apps to SMS text messaging, lets you text from your PC but it costs a few dollars per year. Make sure you’ve updated to the latest version of Android Messages and open it on your phone. It’s pre-installed on many devices, but you can download it from the Play Store if you don’t have it. You’ll also need to set it as your default SMS app for full functionality. Tap the three-dot Menu in the upper-right corner of Messages and choose Messages for web. If you don’t see this yet, you’ll need to wait for the update to roll out to you. Open Google’s Messages for Web page on your computer’s browser (it won’t work with internet Explorer). If you want to stay signed in, enable the Remember this device slider. Then tap Scan QR code on your phone, and use your device’s camera to scan the code on your PC screen. Once it completes, your latest conversations will appear on your PC. Google says that they’re encrypted and cached in your browser. If you don’t access this for 14 days, Google will automatically sign you out for security. If you want to use a dark theme on the website, open Menu > Settings > Enable dark theme. You can pair with multiple computers, but only your current one will be active at a time. And since this goes through your phone, it won’t work when your phone is off. For convenience, you can use Chrome to create a pseudo-app for this on your PC. While on the Messages page, go to Menu > More tools > Create shortcut. Give it a name and check Open as window to add a link to it on your Taskbar. Then you can access your messages in a dedicated window. 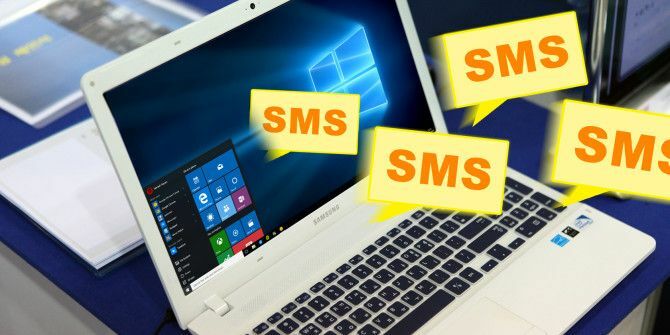 If you’re not tied to SMS texting, check out the best messaging apps that work on both your phone and computer 7 Messaging Apps You Can Use on Your Phone or Computer 7 Messaging Apps You Can Use on Your Phone or Computer Want to send messages from both your phone and your computer? Grab one of these options to continue the conversation wherever you go! Read More . Agreed - doe NOT work for free in Australia. It should be also noted that it will (at least) only work in the US, AFAIK. Your title is misleading. Because this goes through your phone, any carrier charges for texting on your phone will be charged. Pretty disappointed in this site these days, I frequently see errors and incorrect information.